This page uses content from Wikipedia. The original article was at Super Smash Bros. (series). The list of authors can be seen in their page's history. As with SmashWiki, the text of Wikipedia is available under the Creative Commons Attribution-ShareAlike 3.0 Unported Licence. Super Smash Bros., known in Japan as Dairantō Smash Brothers (大乱闘スマッシュブラザーズ, Great Fray Smash Brothers), often shortened to Smash Bros. or simply Smash, is a series of crossover fighting games published by Nintendo, featuring characters from franchises established on Nintendo systems. The series had a successful start in 1999 with the game Super Smash Bros. released on the Nintendo 64. It achieved even greater success with Super Smash Bros. Melee, released in 2001 for the Nintendo GameCube, becoming the best selling game on that system. The third installment, Super Smash Bros. Brawl, was released on the Wii throughout the year of 2008. The fourth game in the series, Super Smash Bros. 4, was first released for the Nintendo 3DS in September 2014, while the Wii U version was first released in November 2014. Masahiro Sakurai has directed all five games despite HAL Laboratory handing the series to a new developer for Brawl. A recent game in the series, Super Smash Bros. Ultimate, was released for the Nintendo Switch on December 7, 2018. Super Smash Bros. was introduced in 1999 for the Nintendo 64. It was released worldwide after selling over a million copies in Japan. It featured eight characters from the start, with four unlockable characters, all of them created by Nintendo or one of its second-party developers. In the multiplayer (Versus) mode, up to four people can play, with the specific rules of each match being predetermined by the players. There are two different types that can be chosen: Time, where the person with the most KOs at the end of the set time wins; and stock, where each person has a set amount of lives, and when it is gone, the player is eliminated. This game's one-player mode included an adventure mode that always followed the same series of opponents, although the player could change the difficulty. Other single player modes exist such as Training and several mini-games, including Break the Targets and Board the Platforms. All of these were included in the sequel, with the exception of "Board the Platforms". In Versus mode, there are nine playable stages: eight starter stages that are based on each of the starting characters (including Peach's Castle for Mario, Congo Jungle for Donkey Kong, Hyrule Castle for Link, Planet Zebes for Samus Aran, Yoshi's Island for Yoshi, Dream Land for Kirby, Sector Z for Fox McCloud, and Saffron City for Pikachu), and the unlockable Mushroom Kingdom. Bowser attacks Ness, Kirby and Yoshi in Super Sudden Death mode on the Great Fox in Corneria. Super Smash Bros. Melee was released November 21, 2001 in Japan; December 3, 2001 in the Americas; May 24, 2002 in Europe; and May 31, 2002 in Australia for the Nintendo GameCube console. It had a larger budget and development team than Super Smash Bros. did and was released to much greater praise and acclaim among critics and consumers. Since its release, Super Smash Bros. Melee has sold more than 7 million copies and was the best-selling game on the GameCube. Super Smash Bros. Melee features 26 characters, of which 15 are available initially, more than doubling the number of characters in its predecessor. There are also 29 stages. It introduced two new single-player modes alongside the Classic mode: Adventure mode and All-Star mode. Adventure mode has platforming segments similar to the original's "Race to the Finish" minigame, and All-Star is a fight against every playable character in the game, allows the player only one life in which damage is accumulated over each battle, and the character is allowed to use only three items which heal all taken damage in between battles. There are also significantly more multiplayer modes and a tournament mode allowing for 64 different competitors whom can all be controlled by a human player, although only up to four players can participate at the same time. Additionally, the game featured alternative battle modes, called "Special Melee," which involve some sort of alteration to the battle (ex: all characters are giant by default, players may only use their jump and standard attack buttons, etc. ), along with alternative ways to judge a victory, such as through collecting coins throughout the match. Although a third Super Smash Bros. game had been announced long before E3 2006, Nintendo unveiled its first information in the form of a trailer on May 10, 2006, and the game was named Super Smash Bros. Brawl. The trailer featured Solid Snake, of Konami's Metal Gear fame, marking the first time that a third-party character had been introduced as a playable character in a Super Smash Bros. title. A second third-party character, Sonic the Hedgehog, from Nintendo's former rival Sega was also confirmed as a playable character on October 10, 2007. Brawl is also the first game in the franchise to support online play via the Nintendo Wi-Fi Connection. At E3 2011, it was announced that there will be a fourth entry in the Super Smash Bros. franchise. The game is available on the Nintendo 3DS and on the Wii U. Development began in late February 2012, and the 3DS version was released on September 13th, 2014 in Japan, and was released on October 3rd, 2014 internationally, while the Wii U version was released on November 21st, 2014 in the Americas, on November 28th, 2014 in Europe, on November 29th, 2014 in Australia, and on December 6th, 2014 in Japan. Sonic the Hedgehog returned as veteran third party fighter from Sega while new third-parties were also added to this game: Mega Man from Capcom and Pac-Man from Bandai Namco. Later, when DLC was announced for the game, Ryu from Street Fighter was added as the first DLC newcomer.Then, during the November 12th, 2015 Nintendo Direct, Cloud Strife from Final Fantasy was the second DLC newcomer announced, thus adding Square Enix to the list of third-parties represented in SSB4. Lastly, in the final Smash Bros. Direct special presentation on December 15, 2015, the Smash Bros. Ballot winner, Bayonetta, was announced and revealed. Her inclusion, as well as Ryu's, make Sega and Capcom the first third-party companies in the series to have more than one fighter. Snake and King K. Rool begin their match at Kongo Falls in Ultimate. On October 2014, a fan asked Sakurai if he was done with developing Super Smash Bros. games, to which he replied: "I'm not done yet...". Despite this, he stated in Weekly Famitsu that he doubts he could continue game development as a whole if his workload stays the way it was for Super Smash Bros. 4. During E3 2018, the title for the next game, Super Smash Bros. Ultimate, was announced as well as its character roster which includes all characters in the Super Smash Bros. series with Inklings, Daisy and Ridley as newcomers. Later during the Super Smash Bros. Ultimate Direct on August 8th, Simon Belmont and his descendant, Richter of Castlevania fame were both announced as new playable fighters adding Konami to the list of 3rd party companies with more than one character that's playable along with Dark Samus and Chrom as echo fighters and Donkey Kong's arch-enemy, King K. Rool as a playable villain. Then at the end of the September Nintendo Direct, Isabelle from Animal Crossing, who appeared in the previous game as a Assist Trophy, was revealed as a playable fighter along with a teaser for a brand new entry on the Switch in 2019. In the second Super Smash Bros. Ultimate Direct on November 1st, Ken Masters, Incineroar, and a Piranha Plant were announced as the final three fighters to complete the roster along with the new Spirits mode, a new story called World of Light, and the Fighters Pass which includes five additional fighters, five stages and music. The first character of this Fighters Pass was revealed to be Joker, the main protagonist from Persona 5, at The Game Awards 2018. The Super Smash Bros. series is a dramatic departure from many fighting games. Instead of winning by depleting an opponent's life bar, Smash Bros players seek to knock opposing characters off the stage. In Super Smash Bros., characters have a damage total, represented by a percentage value, which rises as they take damage and can exceed 100%. As characters' percentages rise, they can be knocked progressively further by an opponent's attacks. To KO an opponent, the player must send that character flying off the edge of the stage, which is not an enclosed arena but rather an area with open boundaries, usually a set of suspended platforms. When a character is knocked off the stage, he may use jumping moves to (attempt to) return; as some characters' jumps are longer-ranged, they may have an easier time "recovering" than others. Additionally, some characters are heavier than others, making it harder for an opponent to knock them off the edge but likewise harder to recover. Smash Bros.'s play controls are greatly simplified in comparison to other fighting games. While traditional fighting games such as Street Fighter or Soul Calibur require the player to memorize button-input combinations (sometimes lengthy and complicated, and often specific to a character), Smash Bros uses the same one-attack-button, one-control-stick-direction combinations to access all moves for all characters. Characters are not limited to constantly facing their opponent but may move around freely. Smash Bros. also implements blocking and dodging mechanics, which can be used both on the ground and in the air. Grabbing and throwing other characters are also possible, allowing for a large variety of ways to attack. 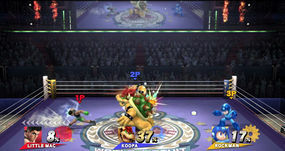 One additional major element in the Super Smash Bros. series is the inclusion of battle items, of which players can control the frequency of appearance. There are conventional "battering items" with which a player may hit an opponent, such as a baseball bat or a sword, as well as throwing items, including Bob-ombs and shells, and shooting items, either single shot guns or rapid fire blasters. Recovery items allow the user to lose varying amounts of their damage percent. From the Pokémon franchise come Poké Balls that release a random Pokémon onto the battlefield to assist the user; Brawl introduces a new "Assist Trophy" item which serves a similar purpose, albeit being capable of summoning a wider range of characters from a variety of franchises. Brawl also introduces items called Smash Balls, which allows fighters to perform powerful character-specific attacks, known as Final Smashes. Sometimes colloquially referred to as "The Original Twelve", the above characters appeared in Super Smash Bros. for the Nintendo 64, and all went on to appear in future installments of the series. There are 78 (if Pokémon Trainer's Pokémon count as three characters) known playable characters in total. Smash 64 has 12, Melee has 26 (if Sheik is put separate from Zelda), Brawl has 39 (if Sheik and Zero Suit Samus are put separate from Zelda and Samus, respectively, and the Pokémon Trainer's Pokémon count as three characters), and Smash 4 has 58 (51 on disc and 7 downloadable), almost five times the amount of the number in Smash 64. Ultimate uniquely brings back all of the characters from past games, as well as at least 12 newcomers (with one being downloadable). Many of the characters are available from the start, but some are unlockable, meaning certain conditions must be met before they can be played as. The following non-playable characters appear only in the various single-player modes throughout the series, controlled by the computer. The player can control them only by using various cheat devices and the Master Hand glitch. Most of the non-playable characters were created for use in the Super Smash Bros. series. 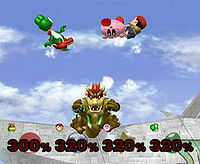 Throughout the Super Smash Bros. series, most single-player modes have included several non-playable boss characters. These bosses generally have a number of advantageous characteristics, such as extreme resistance to being knocked off of the screen. Most of these bosses were created specifically for the Super Smash Bros. franchise, though some have made appearances in other games. Master Hand appears in both Super Smash Bros. and its sequel Super Smash Bros. Melee as the final boss of Classic Mode and the 50th Event Match "Final Destination Match". Super Smash Bros. Melee introduced a left-hand counterpart to Master Hand named Crazy Hand, which appears alongside Master Hand in some scenarios. Master Hand also makes several appearances in Kirby & the Amazing Mirror as a miniboss, and partnered with Crazy Hand as the bosses of Candy Constellation. He also makes an appearance in Kirby: Squeak Squad as a gray hand that can shift its shape to form swords and the like. Master Hand and Crazy Hand look identical aside from their laterality, but Crazy Hand's fingers act in a more erratic and chaotic way. While Master Hand is more relaxed and mature, Crazy Hand is impulsive and destructive and his fingers move differently when he is preparing for an attack. His attacks are wilder and faster than those of Master Hand. When being fought simultaneously, Crazy Hand and Master Hand are able to execute moves together, including a series of claps, and the two hands making fists. Super Smash Bros. also introduced Metal Mario (originally from Super Mario 64) and a Giant Donkey Kong. Metal Mario is simply Mario with increased resistance to being knocked out of the stage as well as a faster falling speed and more attack power, while Giant Donkey Kong is simply a larger and more powerful version of Donkey Kong. Super Smash Bros. Melee's Adventure Mode introduced more boss characters that were enhanced versions of playable characters, such as the Tiny Donkey Kong duo, Giant Kirby, and Metal Luigi. However, due to items introduced in Melee, such as the Metal Box, Super Mushroom and Poison Mushroom, all of these seemingly non-playable characters (including the enhanced characters that were unplayable bosses in the first game) are indeed playable for short amounts of time as they allow all characters to become Metal, Giant or Tiny. Dark Link, a completely black form of Link, appeared in Melee as a non-playable character. In Super Smash Bros. Brawl, gamers are able to play as Dark Link in the form of a color change for Link. Giga Bowser, known in Japan as Giga Koopa (ギガクッパ), is a gigantic, enhanced version of Bowser introduced in Melee. He is the secret final boss of Melee's Adventure Mode, only appearing if the player clears Adventure Mode on Normal level or higher in 18 minutes or fewer without continuing. Beat him without using a continue to get his trophy. He is also one of the fighters in the final match of Melee's Event mode, "The Showdown", with Mewtwo and Ganondorf by his side. Giga Bowser has several abilities that the regular Bowser does not. He is so large that he is immune to grabs and similar grabbing moves. 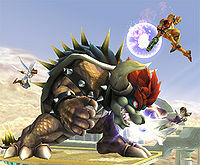 As with Metal Mario, Giga Bowser becomes playable for short periods of time in the following game, Super Smash Bros. Brawl, when Bowser performs his "Final Smash" attack. Bowser transforms into Giga Bowser, and is practically invincible until the effect of the Final Smash wears off. Super Smash Bros. Brawl's adventure mode, The Subspace Emissary, also features boss characters. Some of these characters, such as Petey Piranha, are characters borrowed from other franchises. Others are original and are only in Super Smash Bros.; Galleom, Duon and Tabuu are examples. Super Smash Bros. 4 also have bosses that appear on regular stages, being from that stage's origin series, such as Ridley (from Metroid) and Yellow Devil (from Mega Man). The game also has an extra boss named Master Core, which only appears on higher intensity on Classic Mode. Super Smash Bros. Ultimate adds new bosses that show up at the end of Classic Mode and in the World of Light mode, such as Rathalos (from Monster Hunter), Ganon (from The Legend of Zelda), or Marx (from Kirby). There's also returning bosses like Giga Bowser, Galleom, with Master Hand and Crazy Hand. Finally, there are the two antagonists of World of Light, Galeem and Dharkon. Fighting Polygons, Wire Frames and Alloys. Fighting Polygons (or "the Fighting Polygon Team") are metallic-looking purple clones of playable characters made completely out of crude polygons in Super Smash Bros. for the Nintendo 64. The next to last level in the game contains 30 of these clones of existing Smash 64 characters. They use near-perfect models as their character-counterparts with minute changes to their anatomy, and with a purple texture. In Super Smash Bros. Melee, the Fighting Polygons are replaced by the Fighting Wire Frames. Unlike the original game, there are only two types of Fighting Wire Frames (Male and Female) as opposed to a Polygon corresponding to each individual character base. The only distinct characteristics Fighting Wire Frames have is that there is a Heart inside their chest and the Super Smash Bros. symbol where their face should be. Both the male and female Fighting Wire Frames possess these. Male and Female Wire Frames have the frame and gait of Captain Falcon and Zelda, respectively. Both models lack special moves. In Super Smash Bros. Brawl, the Fighting Alloy Team supersedes both other teams and come in four colors, shapes, and sizes. In Smash Bros 4 however, they were replaced by Fighting Mii Teams. They wear a black shirt that has the letter M, instead of a crudely made model of another character. There are three different types of Fighting Mii Team members. Along with Melee's Adventure Mode came the inclusion of minor, generic enemies, such as Goombas from the Super Mario franchise and Octoroks from the The Legend of Zelda franchise. This trend continues into Super Smash Bros. Brawl to an extent; only enemies from the Mario series reappear (Goombas, Hammer Bros, Bullet Bills, and Koopa Troopas) due to Bowser's hands-on role in the SSE as a villain. Waddle Dees also appeared in a cutscene, but they never showed up as regular enemies. 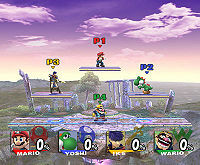 Brawl's adventure mode also includes an assortment of original characters to serve as non-playable generic enemies led by the Subspace Army. The Subspace Army are the antagonists of Super Smash Bros. Brawl, appearing in The Subspace Emissary and led by the Ancient Minister. Their goal is to bring the entire World of Trophies into Subspace piece by piece with devices called Subspace Bombs (detonated with the aid of two R.O.B.s), though their motives are a mystery. Among their foot soldiers are the Primid, the primary offensive force of the Subspace Army, said to come in various forms to do battle. They can be seen forming out of strange purple spores that clump together. A variety of other enemies exist; along with the R.O.B. Squad, assorted original enemies include Bytans, small spherical enemies capable of self-replication; Greaps, large robotic figures that attack with large sickles; and Trowlons, enemies with trowel-like bodies that attack by lifting opponents, among many others. 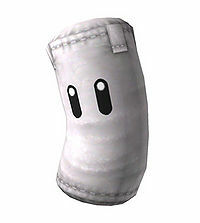 Sandbag (サンドバッグくん, Sandobaggu-kun) appears in the "Home-Run Contest" minigame in Super Smash Bros. Melee, Super Smash Bros. Brawl, and Super Smash Bros. 4. The object is to strike it as far as possible with either a supplied Home-Run Bat or a fighting move. Sandbag's only purpose is to get hit in the Home-Run Contest. Being hit all the time does not hurt it; it actually loves to see players "wind up and let loose," according to the trophy description. During the actual Home-Run Contest challenge, a player will use their chosen character to hit Sandbag off the pedestal on which it rests within ten seconds. Players damage Sandbag as much as possible while keeping on the orange platform so that it will fly farther. In Brawl, the "Home-Run Contest" also features two-player modes, online play, and a shield that keeps Sandbag on the platform while it is being damaged. Players may also practice by attacking Sandbag while online multiplayer matches load. ↑ David Radd (2006-11-17). Opinion: Wii Won't Rock You. GameDaily. Retrieved on 2006-11-27. ↑ Wi-Fi Play. Smash Bros. DOJO!!. Smashbros.com (2007-09-18). Retrieved on 2007-09-18. ↑ Super Smash Bros. Isn't Finished Being Made. Kotaku. ↑ Smash Bros. Could be its Creator's Last Game. Kotaku. ↑ Super Smash Bros. is coming to Nintendo Switch!. ↑ Super Smash Bros. Ultimate - E3 2018 - Nintendo Switch. ↑ Video of Dark Link in the Brawl Demo made available at EforAll 2007. ↑ Bowser's page on the official Super Smash Bros. Brawl website. ↑ The Enemies From Subspace. This page was last edited on April 8, 2019, at 21:09.